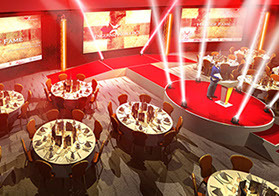 At 2cheeseburgers we have developed a hugely popular and affordable service whereby we can visualise proposed conference and event sets using 3D modelling software. Our 3D visuals are detailed and attractive, and will no doubt help you get the desired message across. We usually improve the 3D renders by adding various lighting effects in Photoshop, thereby adding some 'sizzle' to an already useful product. 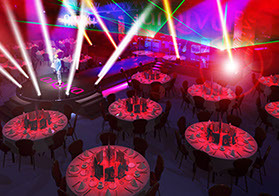 3D visual created in 2014, showing LED lightboxes, moving lights ...and even table menus! 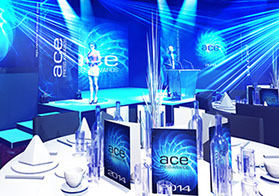 A 2014 visual for a gala awards event, demonstrating spectacular up-lighting effects. 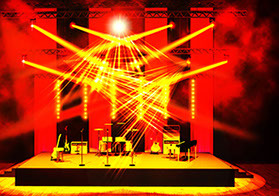 A 3D visual showing intense, multi-lighting states, in the style of a rock gig. 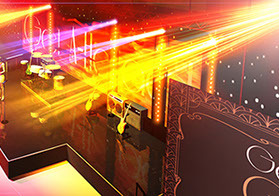 3D visual for a charity event, showing a band set up on stage, moving Mac lights, etc. 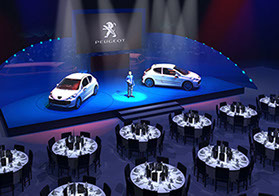 A 2014 visual depicting a proposed Peugeot event, with 2 cars, each on a revolving disc. Visual demonstrating various spectacular lighting states; moving floor spots, lasers, etc. 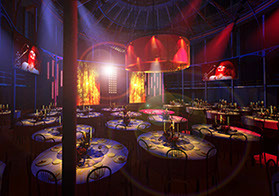 2011 Visual depicting an event in London's Roundhouse, modelled just for these visuals. 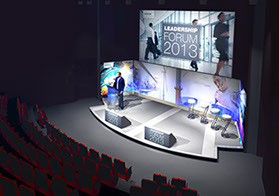 Siemens Internal management event, designed and visualised in 2014. 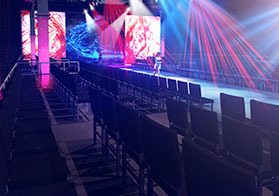 One of a major series of fashion event visuals in 2012.